Kilauea is ranked among the world’s most active volcanoes. This shield type volcano measures 4,190 feet above sea level. It is one of five volcanoes that make up the Island of Hawaii and also the most active them all. This volcano is estimated to be between 300,000 and 600,000 years old which makes it the youngest of the five. The name of this volcano is a Hawaiian term which means ‘much spreading’ or ‘spewing’. It has got this name because of its frequent lava flow. The last significant eruption of Kilauea occurred in 1983. It began on January 3 and is called Pu’u’O’o. Since the 1918 eruption it has only been dormant for 18 years between 1934 and 1952. It has had sixty one different eruptions since 1823. This volcano covers about fourteen percent of Hawaii’s Big Island. Kilauea has more than two dozen craters. The summit caldera measures 2 miles by 2 miles in size and its walls reach around 400 feet. The main caldera has a lake of lava that periodically rises to the surface. Kilauea is a part of the Hawaii Volcanoes National Park. This national park was established in 1916. In Hawaiian myth and culture, this volcano is home to Pele, the goddess of fire and volcano. Once this volcano was thought to be part of the extremely large volcano Mauna Loa. Mauna Loa is the largest volcano in the world. Declan, Tobin. " Kilauea Facts for Kids ." Easy Science for Kids, Apr 2019. Web. 26 Apr 2019. 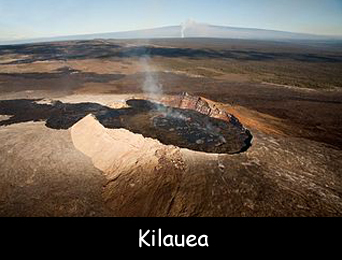 < https://easyscienceforkids.com/kilauea-facts/ >.